Conservative bloggers must really identify themselves with the most extreme elements of the right wing. 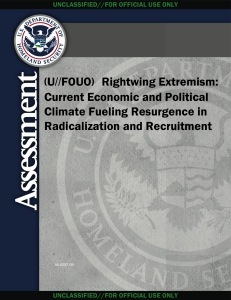 The Department of Homeland Security has declassified a report on right wing extremism. (PDF file here). The report is on white supremacists, right wing militias, and those who support violence like Timothy McVeigh. Such extremism is a real threat and it is not surprising that the Department of Homeland Security has seen a reason to describe this threat. After all, this has been the major source of domestic terrorism in recent years. My bet is that somewhere they also have reports on violent extremists of the far left. There is certainly a lot of paranoia on the right. For an example, see David Weigel’s gun show report. It is certainly reasonable for people in Homeland Security to be concerned about such people should they support violence. A report describing extremists and warning of the risk of violence is far different from advocating suppression of their speech or of rounding them up in gulags. I fail to understand why the right, rather than seeing the extreme right which advocates violence as a problem, sees this report as being about them. I certainly don’t feel any similar affinity towards extremists of the far left and would have no concerns about a similar report on left wing extremists. Posted in Blogs & Social Media, Terrorism. Tags: Conservatives, David Weigel, Republicans, Terrorism. RSS feed for comments on this post.. TrackBack URL. It is very interesting that the conservatives are that paranoid/delusional in ASSuming this report is about them. It appears this is yet another attempt to blame democrats/Pres. Obama and inflame the base. The report clearly talks about the extremist groups, White Supremacists, Oklahoma City and other group. Malicious Malkin reminds me of the person who will always blame other/feel persecuted and is always soooo predictable. I utterly do not understand the notion of SupportViolence as a boolean attribute with no input conditions. Is there anyone anywhere who never supports violence? Even Gandhi condemned the British government confiscation of Indian arms. For the purposes of a brief blog post I don’t think it is necessary to worry about the rare cases where violence might be supported. Those who currently advocate violence against the US government are a fair topic for at such a report describing them. It’s not like they are advocating rounding them up for holding views which might support violence under some circumstances. Almost all of what I have seen is not “advocate violence now” but “prepare now for when/if violence becomes the appropriate course”. Which is completely different. I’d worry about how such groups would decide that violence has become the appropriate course. There was also a report on possible threats from left-wing extremists a couple months ago. That went by without a peep — ironically, this FauxNews article mentioning that in passing is the first I’d heard of it. As for the right-wing reaction to this: it’s funny how the same people barking they’re going to be silenced now were running around calling critics unAmerican back when The Man was a Republican. Real anti-government types don’t care who is in office. Ron — well, there are historical indications. In 1776 the decision happened when government forces marched in to confiscate weapons from civilian owners. And, in 1794, it was in response to government forces marching in to take the whiskey. I regret that that rebellion didn’t also succeed. I think the reason why you see conservative bloggers respond to this report is due in part to the false mindset that our political spectrum is two-dimensional. For some reason, the media and politicians both think the general public cannot comprehend a multi-dimensional view on politics, where there isn’t just a “left” and “right.” And the fact that this report comes out focusing on “rightwing extremism” and not “extremism” in general gives the impression that the Administration is trying to continue to pump the two-dimensional view. In fact, much of what is said in this report is identical to what occurs with “leftwing extremism” (to continue the flat-line concept). ELF does more in terms of actual terrorism (politically motivated criminal acts) including destruction of private property and creating a harmful environment, just as an example. Personally, I think people both on the “left” and “right” should be upset over this report and expect that their employees (which the Administration is) do a better job of expressing their concerns in the future without lowering the mental bar by using simple-minded labels. Diane — I think you’re correct that the report wasn’t aimed at the conservative mind set (at least I hope not! ), but it appears it was a sloppy piece of work, especially the footnote that defines “rightwing extremism in the United States” as including not just racist or hate groups, but also groups that reject federal authority in favor of state or local authority. Taken at face value, it says that everyone supportive of federalism and/or upset about taxes, etc., is now considered a potentially dangerous “rightwing extremist” by Homeland Security. The Homeland Security Office of Intelligence and Analysis really should elaborate on that rather than leave it hanging in a footnote . . .
That footnote is being taken as having a meaning far different from what it actually says. It does not say that everyone who supports federalism or is upset about taxes is considered a potentially dangerous extremist. It is speaking of the extremists who outright reject federal authority or who reject all government authority. It doesn”t even mention taxes. The real purpose of the footnote is to point out that rightwing extremism can broadly be divided into two groups, those which are primarily hate groups and those which are primarily based upon opposition to government authority. Those who are concerned about this document are claiming it says things which are quite different from what it actually does say. Hummm . . . it comes real close to crossing a line, and I think people sense that, and it’s not just that footnote. As you know, Bush et al. increased domestic surveillance and wiretaps — perhaps not to an unprecedented degree, but the increase was significant. “As I am certain you agree, freedom of association and freedom of speech are guaranteed to all Americans — whether a person’s beliefs, whatever their political orientation, are ‘extremist’ or not,” Mr. Thompson said. Apparently, at the end of the report, the DHS has planned, with law enforcement officials, to monitor legitimate public political activity. Thompson said he was “particularly struck” by this statement. I don’t know law, but this seems a violation of the presumption of innocence. The danger, the slippy slope, is that it brings the government uncomfortably close to treating political discourse as a potentially subversive activity. I think this is what “struck” Thompson. I think anyone, on the right or left, concerned with the encroachment on privacy and increased govt. surveillance would be — and should be — concerned with such a statement. Thompson’s a liberal al in every sense of the word. If he’s worried — I’m worried. These claims about veterans are a distortion of what the report actually says. (Even Little Green Footballs has been chastising conservatives for such distortions). The report does not treat discourse as “potentially subversive activity.” It is clearly concerned with those who practice violence, not with discourse. Worse, according to constitutional lawyer Glenn Greenwald, the Obama DOJ has gone even further than the Bush team, arguing that “all claims of illegal government surveillance are immunized in the absence of ‘willful disclosure’ to the public of the intercepted communications.” (This means the government now cannot be sued unless the results of an illegal surveillance are made public).